How can you turn an old sock into a friendly octopus? With a little imagination and a few handy art supplies, it’s a snap. 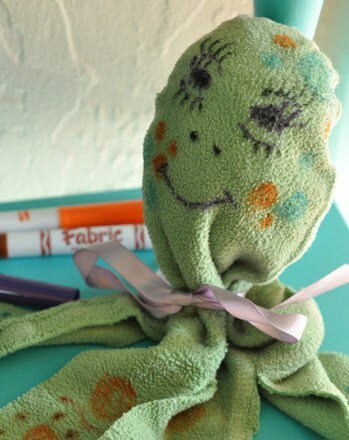 Encourage your child to jump into sea creature science by creating her own colorful “socktopus.” Accompany the art project with fun octopi facts to introduce her to this fascinating ocean animal. We’ve included a few facts at the end of this activity to get you started. Help your child tear pieces of newspaper into small squares, about 4″ x 4″. Ask her to crumple up the newspaper squares and stuff them into the toe of the sock. Fill the sock about one third full with newspaper. Have her scrunch the newspaper up toward the toe, and mold it into a sphere. For a quick geometry lesson, talk about the difference between a sphere and a circle with her. Tie the yarn or ribbon around the sock at the base of the sphere to create the octopus head. Now make the octopus tentacles. Help her make four straight cuts in the bottom part of the sock (along the length of the shaft) to create strips for tentacles. How many tentacles does an octopus have in all? Now that the form of the octopus is complete, it’s time to decorate. Invite her to draw a face and other decorations on the octopus with markers. She can make the octopus realistic or rainbow-colored—encourage her to be imaginative! Did You Know? The octopus is a member of the class Cephalopoda, a class characterized, among other things, by bilateral symmetry, which means it looks the same on both halves of its body. Aside from its recognizable 8 arms, or tentacles, the octopus is known for its exceptional intelligence. What a fun use for an old sock. I like the “Did you know?” that you put at the end of the post. I never realized an octopus could be intelligent!